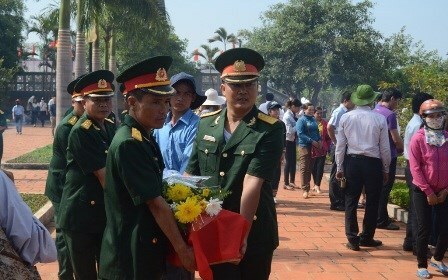 Gia Lai (VNA) – A ceremony was held at a martyr cemetery in the Central Highlands province of Gia Lai on May 14 to rebury the remains of 30 Vietnamese volunteer soldiers and experts who died in the Cambodian battlefield during wartime. The remains were found in the Cambodian provinces of Rattanakiri, Stung Treng and Preah Vihear during the 2015-2016 dry season. So far, as many as 1, 345 sets of remains of fallen Vietnamese soldiers and experts have been repatriated from Cambodia . About 4,000 Vietnamese volunteer soldiers who died during wartime are still lying in Cambodia . The two countries have set a target of completing the majority of the search, gathering and repatriation of martyr remains by 2020.